Currently the rave of the moment, the easy on the eyes actor has made himself something of a legend among African and Caribbean movie lovers. 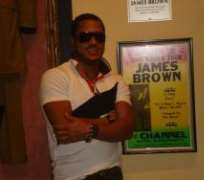 Van Vicker first starred in the Venus Film Productions Divine Love alongside Rama Brew, Akofa Asiedu, and Jackie Appiah. The African community in New York honored the actor in 2007 with the Five Continent Award for his skills and valor. Van Vicker is best known for his role as Raj in the Venus Films big hit Beyonce. He is also voted the best selling actor for the year 2007 by the African Film Marketers.